Samsung recently registered the name Galaxy J7 Sky Pro in the United States at Patent and Trademark Office. This news has been known while at the same time were leaking data from the Samsung SM-G615F, probably the Galaxy J7 2017. From both information, due to the similarity of specifications, let's assume that the Galaxy J7 Sky Pro is an option for the Galaxy J7 (2017) in the US market which, according to the latest rumors, should incorporate an Exynos 7870 processor with 2/3 GB of RAM and 16 GB of internal memory, a 5.5-inch HD or Full HD display, a battery of 3,000 mAh and an operating system based on the Android 7.0 Nougat version. It is also possible that the Samsung SM-G615F is actually the Galaxy J7 Prime 2017. In any case, the close similarity between the names could translate into an almost identical design, with a back case with a black horizontal stripe that makes irrelevant the relief of the flash and the camera, and a clean profile with slightly rounded edges. 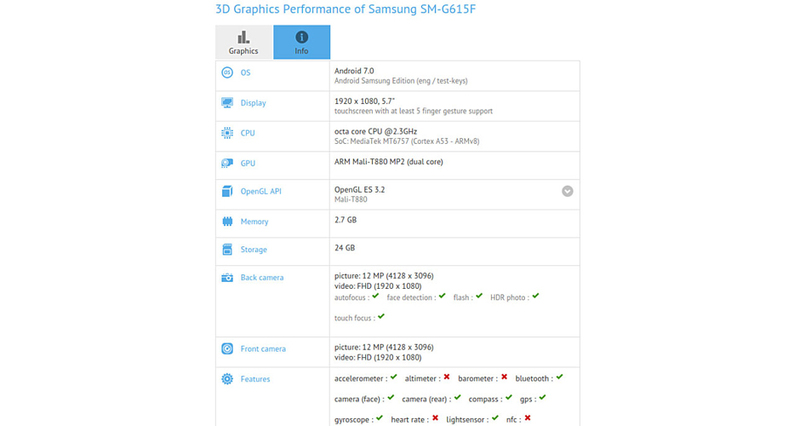 According to data known through GFXBench, the Samsung SM-G610F is built around a resolution of 5.7 inches Full HD (1,920 x 1,080 pixels) and is powered by the MediaTek MT6757 chipset with ARM Mali-T880MP2 GPU and 3 GB of RAM, plus 32 GB of internal memory. The photographic section consists of two 12-megapixel sensors, one front and one behind, and the operating system is Android 7.0 Nougat too. Taking into account that the Samsung SM-G610F is equivalent to the first Galaxy J7 introduced in September 2016 and the launch took place in India, it is not impossible to think that this SM-G610F is its successor, the Samsung Galaxy J7 Prime 2017, and the coincidence of the registration of the Galaxy J7 Sky Pro makes all thoughts lead to the same conclusion.